Oven Roasted Tenderloin with a sidekick. I am glad that a birthday party only comes once a year but with that being said Mira and her friends had a great time wall climbing and just hanging like you do when you are six. I was not in the mood of standing in the kitchen for too long this evening and eating a low carb, non-dairy diet but yet a sauce lover I wanted to make something to go with that tenderloin that was not mayonnaise. I used the mayonnaise recipe as base but changed the measurements and added a little actually turned out to be a real hit…Freddie loved it! How to: I started by cleaning the pork and rub in the seasoning. Fry the tenderloin in olive oil till it has a nice brown surface. 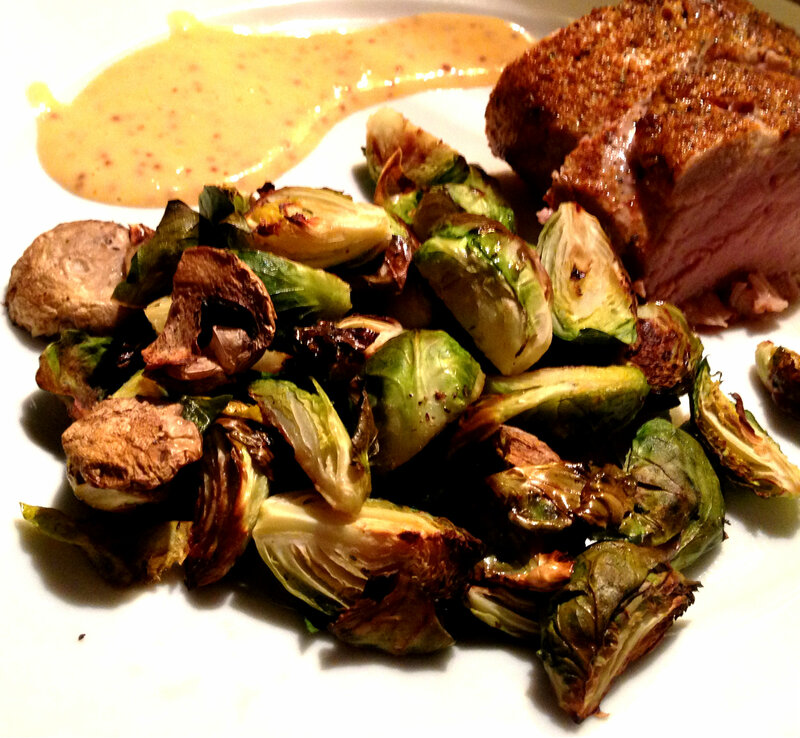 As you probably has figured out I LOVE oven roasted Brussels sprouts so I placed them together with the pork in the oven at 400F/200C for about 20 minutes or till the meat are cooked and then I seasoned with salt and pepper (I have a feeling you should not eat really red pork but it is ok if it is a little pink). For the sidekick I used my Kitchen aid stand mixer because it is so easy and quick. I added all the ingredients except the oil and the Rooster sauce and mixed it together. Then add carefully the oil while the machine is still going, I didn’t want that thick mayonnaise feeling and with a lot less oil this was much thinner more like a sauce. I finished it off adding the rooster sauce and kept on adding till I was happy with the spiciness. This entry was posted in Recipes and tagged dairy free, diet, family, fitness, gluten free, Home, inspiration, kids, lifestyle, low-carb, motivation, recipe, weight loss by Malin. Bookmark the permalink. I LOVE brussel sprouts as well!